Bande (Italian for "Bands") was in Italian military terminology the name used to designate irregular forces, composed normally of foreigners or colonial natives, with some Italian officers and NCOs in command. These units were employed by the Italian Army as auxiliaries to the regular national and colonial military forces. They were also known to the British colonial forces as "armed Bands". A "Banda" (singular) was approximatively a company size unit. 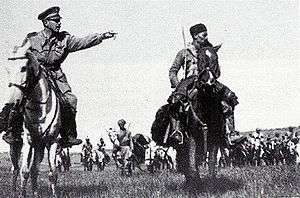 The larger unit was the battalion size "Gruppo Bande" (infantry) or "Gruppo Squadroni" (cavalry). The "Milizia" a regimental unit appeared briefly during the fascist period in the Balkans. The first of these irregular units employed by the Regio Esercito originated from a mercenary Arab force employed by the Ottoman Empire and called Basci Buzuk, that was created in Eritrea by the Albanian adventurer Sagiak Hassan in the second half of the 19th century. In 1885, the Italian Colonel Tancredi Saletta, commanding officer of the first Italian troops involved in the conquest of Eritrea, enlisted Bashi-bazouks in the service of Italy. As lightly armed irregulars the Bands were able to perform duties for which regular Italian and colonial troops were unsuited and at lower cost. Locally recruited bands were employed in the conquest of Italian Libya from 1911 to the 1930s. Their Somali counterparts played an important role in Italian Somaliland during the 1920s. In Italian Somaliland, the Italians also employed Dubats; levies that were maintained on a permanent basis and were better trained and equipped than the essentially tribal Banda. During the guerrilla war that continued in Ethiopia after the 1936 Italian invasion, groups of irregular Banda were recruited amongst tribal groups collaborating with the Italian regime. One of the best known of these was the Gruppo Bande irregolari "Uollo Ambassel" in northern Ethiopia. While most Bande were recruited in the various Italian colonies in Africa, many units bearing this designation were also created as auxiliaries during the Second World War in Albania and in the occupied territories of the former Kingdom of Yugoslavia. Not only the Italian Regio Esercito employed Bands but also the other branches of the Italian armed forces and corps. The Banda n° 9 "della Marina", formed of Greek-Orthodox and local young Italians from Dalmatia, was established in Zara under the control of the Italian Royal Navy. These naval auxiliaries fought side by side with a company from the Reggimento "San Marco" during the period 1941-43. One of the most famous Italian irregular bands was the "Gruppo Bande Amhara". At the beginning of World War II the Italian Viceroy Amedeo the Duke of Aosta gave lieutenant Guillet command of the 2,500 strong Gruppo Bande Amhara, an irregular troops unit made up mainly of recruits from Ethiopia's region of Amhara. This force was primarily a cavalry one, but also included camel mounted troops and some Yemeni infantry led by Eritrean Ascari NCOs. At the end of 1940, the Allied forces faced Guillet on the road to Amba Alagi, and specifically, in the proximity of Cherù. He was charged with the task of delaying the allied advance from the North-West and his Eritrean Ascari were successful but suffered many casualties. Guillet's most important battle happened towards the end of January 1941 at Cherù when he decided to attack enemy armoured units. At dawn the "Gruppo Bande Amhara" charged a column of tanks armed only with swords, guns and hand grenades. They initially passed unhurt through the British forces who were caught unaware. Guillet then turned to charge again. In the meantime however, the British had organised themselves and fired horizontally with their howitzers. Their shells ripped open the chests of Guillet's horses and soldiers before exploding. Nearly 800 died in the charges. This was the last cavalry charge the British faced and the last but one in the history of Italian cavalry. Even if nearly destroyed, the last Amhara cavalry went back to Keren with Guillet, having obtained to delay the British advance and so allowing the orderly retreat of other Ascari and Italian troops from Agordat.